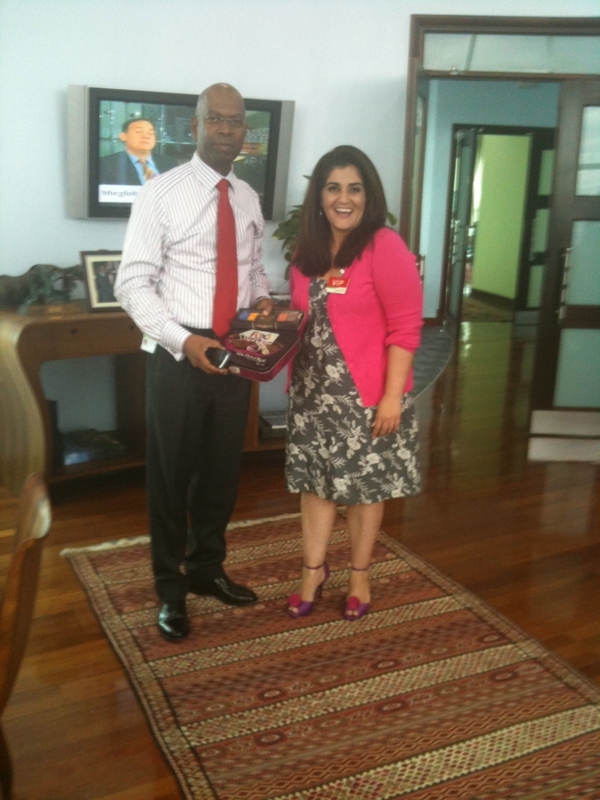 I’ve been telling Bob Collymore, the CEO of Safaricom, that I’d love to drop by to meet him at his office since he was utterly kind to come to my workplace and personally deliver me a box of rather posh chocolates. The invitation has always been open from Bob to drop by so I decided today to take up on it and go and say hello. Since last week I started asking directions of how to get to Safaricom House on Waiyaki Way, what floor Bob was on, where I was supposed to park and if I should bring my own biscuits. (Surely I was going to be offered a cup of coffee right?) So with my own detective work I managed to find out everything I wanted to know except for the biscuits. Bob kindly replied back on Twitter and said I could bring my own. Fair enough. I didn’t expect the CEO of the biggest mobile subscriber company to be donned in an apron on Monday evening baking me cookies to share on Tuesday morning so I got a box of some fancy treats. Off I went to Safaricom House and was seriously fascinated with the security measures that I underwent. There were two entrances to Tower A & B and I was to go see Mr CEO in Tower A. I sat patiently in my car as the polite security guard did what he had to and I was riveted with the electronic pillars in front of me that were barring my car to move forward until the whole security check was complete. Even the parking was so organised! Nothing like those crazy shopping malls where we’re clamouring for a parking nearest to the entrance. 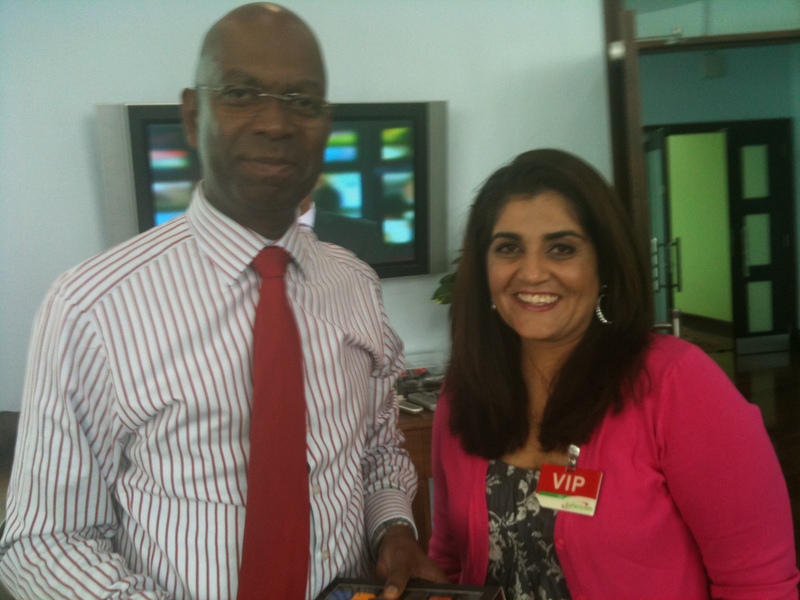 Anyway, I told the security guard I was here to meet Bob Collymore (check me out name dropping) and he told me to go to the VIP car park. I had to stifle a gasp. Sorry but that’s the truth. I was like a country bumpkin in my posh heels in a VIP car park and it just started to get better. Now if there is something I really abhor it’s those disgusting plastic security tags you must wear when you go to some buildings but not today! The pretty lady came around to me and pinned on a VIP badge on me herself and led me to the elevator door, which by the way is the CEO’s personal elevator, and directed me to the 7th floor. I got off at the top floor and went to another reception desk where yet another lovely lady led me to a waiting area that had a breathtaking view of Brookside Drive, Lower Kabete Road and its environs. Tried to work out where my friend’s house was and was just about to take a picture when lovely lady was back to ask me if I wanted tea or coffee. I politely declined and within seconds Bob came out to receive me and we did those 3 kisses on the cheek thingie (I’m usually just a one hug person but this was good. Also my lipgloss didn’t leave glitter on Bob’s cheek. I’m not into air kisses.) Before we go to his office he ushers me into a side office where I FINALLY get to meet ‘The Lovely Purity’ and of course ‘The Robbed & Wronged Tabitha’. Apparently the BlackBerry Michael Joseph gifted me was supposed to be hers… I was unrepentant and had no remorse. I had also hidden it deep into my bag just in case I was asked to produce it or something – even that on Silent Mode lest it rang. Bob ushered me into his fantastic office, which I shamelessly admired, and I simply adored the view from the 7th floor. I could see almost the whole of Nairobi! Bob Collymore, CEO Safaricom and KK in posh new heels. Then came the obligatory photo session and I’m just glad I wore my posh new heels. Now then… about that iPhone4….